Scott Whitaker and Daniel Wilk were among the feature winners in Round 5 of the Bojangles’ Summer Shootout Series, which was highlighted by a gigantic Fourth of July fireworks extravaganza. CONCORD, N.C. – There were fireworks on and off the track during Round 5 of the Bojangles’ Summer Shootout Series as intense racing and Fourth of July festivities entertained a huge crowd Tuesday night at Charlotte Motor Speedway. Daniel Wilk and Scott Whitaker were among the seven feature winners of the night, which marked the halfway point of the season. Whitaker dominated in the Security Force Masters division feature and took home his first win of the Bojangles’ Summer Shootout Series season. Ron Mander was the polesitter for the 25-lap race and led until lap 3, when Whitaker took the lead on the backstretch. The race’s single caution took place on lap 13 between Tom Pistone and Robbie Faggart, who were battling for the second position and made contact in Turn 1. Jon Craig restarted on the outside and took the lead from Whitaker off Turn 2, but Whitaker was able to reclaim the lead and cruised on to victory. Carl Cormier finished behind Whitaker and Bruce Silver took third. Wilk, driver in the LiveWell Homes Bandolero Bandits division, continued his winning streak as he claimed a feature victory for the fifth time this season. It didn’t take Wilk very long to find himself in the top five, and on lap 14 he took the lead away from DJ Canipe outside of Turn 2. The last five laps in this 20-lap race was smooth sailing for Wilk, who continues to prove his dominance at the Bojangles’ Summer Shootout Series. Wilk was followed by Carson Kvapil and William Robusto, respectively. Other winners included Josh Speas in the Bandolero Beginner Bandits division, Ashton Higgins in the Bandolero Outlaw division, Jared Irvan in the Legend Car Pro division, Chase Purdy in the Legend Car Young Lions division and Sheldon Crouse in the Legend Car Semi-Pro division. 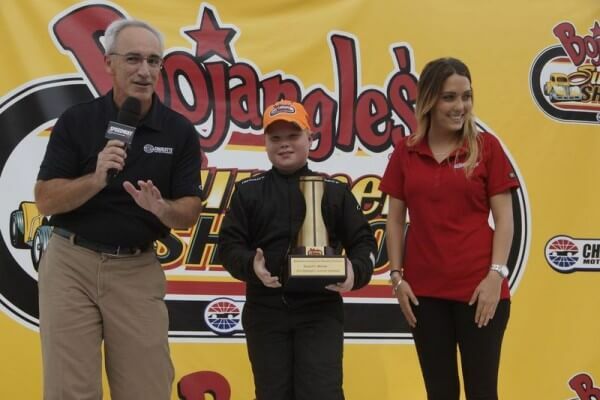 The Bojangles’ Summer Shootout Series continues at Charlotte Motor Speedway on Tuesday, July 7, with the Faster Pastor exhibition race. Local pastors will leave it all on the track as they race school buses to determine which pastor is faster at the intermission of the night’s thrilling Legend Car and Bandolero action. Beginner Bandolero Bandits (17 laps): 1. Josh Speas; 2. Parker Eatmon; 3. Mason Dejarnett; 4. Zachary Miracle; 5. Autumn Weaver; 6. Jacob Gantz; 7. Tyler Bartoszewicz; 8. David Selvik; 9. Stanley Hays; 10. Jake Putman; 11. Jaiden Reyna. LiveWell Homes Bandolero Bandits (20 laps): 1. Daniel Wilk; 2. Carson Kvapil; 3. William Robusto; 4. Josh Kossek; 5. Bryson Ruff; 6. Blake Cisneros; 7. Landon Rapp; 8. Dylan Notaro; 9. Leland Honeyman; 10. Isabella Robusto; 11. Tommy Good; 12. George Hayes; 13. DJ Canipe; 14. Hunter Hutchens; 15. Cameron Bolen; 16. Maddox Blaize. Body Mechanic Human Tuning Group Legend Car Pros (25 laps): 1. Jared Irvan; 2. Greg Lang; 3. Zane Smith; 4. Michael Torres; 5. Jordan Black; 6. Evan Swilling; 7. Joey Padgett; 8. Reid Wilson; 9. Dillon Faggart; 10. Alex Murray.